Ginger is one of the most powerful and popular spices in the world. It originated in Southeast Asia and was considered a tonic root for all ailments by the Indians and ancient Chinese thousands of years ago. It is closely related to turmeric and cardamom. In the 13th century, ginger was dried to preserve its shelf life during long voyages between Asia and Europe. In the 14th century a pound of ginger was worth the price of a whole sheep. Once considered as a luxury, it is now one of the most commonly consumed dietary condiments in the world and is a staple in all Indian kitchens. Ginger is an important spice crop of India and accounts for 45% of the world’s production. It grows in many warm and damp nations such as China, Fiji, Indonesia, Brazil, Jamaica, Nigeria, Sierra Leone, and Australia. Ginger requires warm and humid weather with a well dispersed rainfall of about 150 to 300cm during growing season but it requires dry spells during land groundwork and harvesting. Although ginger grows on a wide range of soils, ones containing not more than 30% sand or 20% clay and free from gravel are favoured for higher yields. You can mince, purée, grate, chop, grind, or slice ginger depending on the dish. There are plenty of ways to store fresh ginger at home, from soaking it in a jar of vodka, to storing it in the refrigerator wrapped in a paper towel, or tucked in a paper bag. However, the best way to make ginger retain its freshness for longer is to place the whole unpeeled ginger in a resealable plastic bag, with the air pushed out, and then store it in the refrigerator. If you cut or peel a part of the ginger then make sure you blot it dry with a paper towel before storing it again. 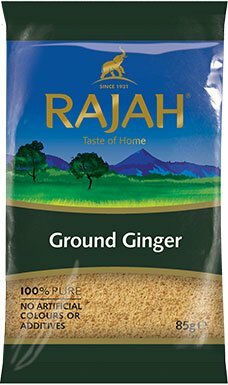 Ground ginger, on the other hand, can be stored in an airtight container in a cool and dry place, away from moisture. Ginger is a super food and an ancient wonder spice. It is a popular warming spice, a digestive aid, and is sometimes used to treat flatulence and colic. It also helps treat many forms of nausea, and helps reduce muscle pain. In India, ginger is liberally used in daily life. Ginger infused chai is a favourite household drink and is most grandmothers’ antidote for battling cold and flu!